GoldSim Blog: How Big Will Melbourne Australia be in 2035? Many of you may be familiar with GoldSim models that incorporate simple population growth (e.g., in order to compute water demands in the future), but may not have seen complex demographic models that fully incorporate all the details required to accurately simulate the population growth for a large urban area. One of our recently showcased models on our website does just that. It probabilistically simulates the population of the City of Melbourne, Australia for the next 20 years. I found this model to be a highly effective population simulator, and believe the approach could potentially be applied to population forecasts for a variety of models. The City of Melbourne, Australia commissioned Geografia to develop a 20-year population projection model using GoldSim that simulates the changes in population by age group, gender, and suburb throughout the City. The results from this model are published on the City’s highly interactive website. The model incorporates uncertainty in national, state and local migration trends and other factors such as dwelling development, household size and occupancy rates. It outputs projections by single year of age, by gender and suburb using arrays of interacting datasets. Aging chains are used to simulate the movement of people by their respective age and gender. Below is a screen capture of one of the interactive plots showing mean population growth. The underlying model was built in GoldSim, which provides an ideal platform for population forecast models. When estimating population growth, there is always a large degree of uncertainty. The model accounts for this by using GoldSim’s powerful Monte Carlo simulation capabilities. Uncertain variables are represented probabilistically in the model. For example, the household size for townhouses in Carlton is one model variable. Rather than a single number (e.g., 2.5 people per house), the variable can be represented stochastically (i.e., something that varies over time in a manner that can be statistically described). The model is run thousands of times in order to provide a comprehensive range of possible outcomes. Hence, the City of Melbourne forecasts can provide ranges of possible futures that explicitly account for the uncertainty in the many inputs. Different statistics can then be viewed (e,g., mean, median, various percentiles) to provide a more complete understanding of how the City's population will grow and change. 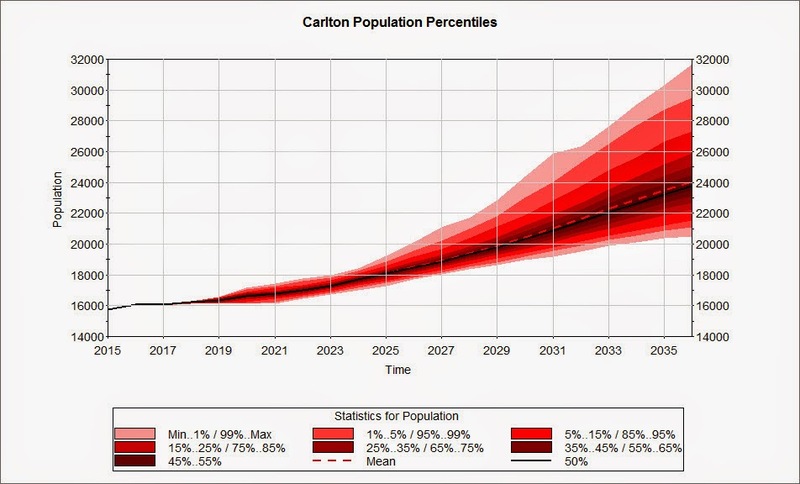 Below is a screen capture from the GoldSim model that shows the probability time history of population growth for one of the suburbs of the City. I was impressed by this model and would love to see more of our users incorporate demographic modeling in their forecast models where population is one of the main drivers. We already have a basic model that uses an aging chain to simulate population of a single area available for use in our library, here. This model can provide the basic building block to incorporate demographic modeling in your project. You can visit our website to read the full article that describes the City of Melbourne model.